So, if you are decorating, remember to breathe. It's supposed to be fun. It's a way to express your personality in a large way through tiny increments--the right sconces for your bathroom, the perfect china for the kitchen, etc. The best way to avoid stress and truly enjoy the process, however, is to understand the product you're looking for. Knowledge is power. Knowledge is happiness. Knowledge is not getting lost in the endless options swirling around you. To help you decorate your home, Comfortex Window Fashions has created a crash course for everything you need to know about window shades and blinds. Let's start right at the top of the pyramid. Cellular Shades are the most popular and most common type of window fashion. Their honeycomb design allows for more light filtration. They are typically more affordable than other types of shades and they can even be motorized for easier adjustment. However, one downside to Cellular Shades is that, unlike slatted blinds, they don't allow for a clear view out of your window unless the shade is fully raised. The difference between window shades and window blinds is that blinds are slatted. You adjust blinds by tilting the slats. 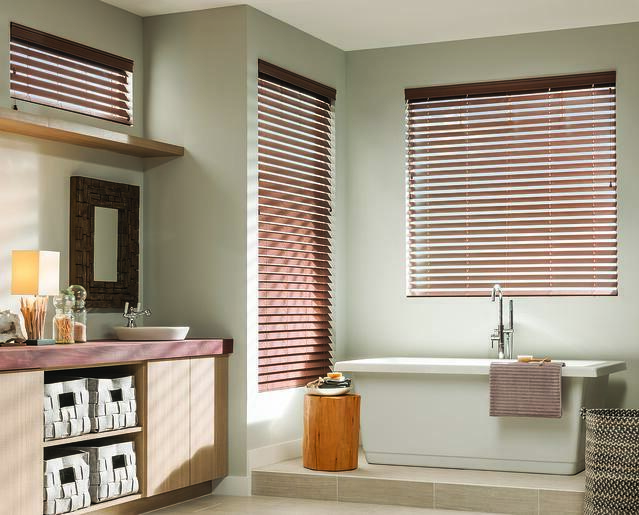 As a result, wood blinds are ideal if you want to have more control over the amount of light filtration and privacy. They are also a popular choice because you have the option of real or faux wood blinds. Both types provide the same features, but real wood blinds are more durable, while faux wood blinds are more affordable. As for the cons, wood blinds usually require more effort to use and maintain than other types of shades. Roller shades are both practical and stylish. They not only provide easy-to-use window coverings, but they can add color, design, and texture to a room. For example, a patterned shade would nicely accent a neutral room. Roller shades tend to be budget-friendly and often cost less than window blinds. Roman Shades are similar to Roller Shades, except they are often more durable. Roman Shades are different from standard window shades because they stack up evenly when being raised; however, when they are visibly smoothed when lowered, not bumpy or ribbed like cellular shades. These shades are sleek and stylish, but are generally priced higher than Roller and Cellular shades. Sheer Shades will let the most amount of light into your house. They are perfect for rooms where you'll be entertaining or socializing, like kitchens and dining rooms, and they are also a popular choice for covering larger windows. Vertical Shades are an eye-catching way to cover taller windows and sliding glass doors. They are offered in several different styles, including cellular and sheer. You can also look into Panel Track Shades, which are an innovative and modern vertical shade.